iCloud is Apple’s free online service, which includes calendar syncing among its many features. BusyCal can connect to iCloud for syncing calendars across your devices and sharing them with others. BusyCal can use iCloud to sync calendar data across your devices. iCloud functions as a CalDAV server that syncs with client apps. BusyCal (for both iOS and Mac) and the built-in Calendar app on iOS and OS X are CalDAV clients that sync with iCloud. This means any data you enter into the built-in Calendar app on iOS or OS X will sync to BusyCal through iCloud, and vice versa. As long as you have all client apps configured to sync with the same iCloud account, all your calendar data remain in sync. Tap the Connect button next to iCloud. Enter your iCloud Apple ID and password and tap Add. Note: You must use an app-specific password to sync BusyCal with iCloud. iCloud functions as a CalDAV server that hosts your calendars and syncs them with client apps. This means any data you create on an iCloud calendar using the built-in Calendar app on iOS or OS X will sync to BusyCal through iCloud, and vice versa. As long as you are hosting all your calendars on iCloud and have all client apps configured to sync with the same iCloud account, all your calendar data will remain in sync. 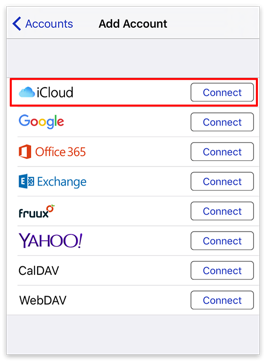 All calendars you want to sync between your iOS devices, Macs, and other users must be hosted on iCloud. You cannot sync calendars from other sources (Google, Exchange, etc.) to iCloud. Apple requires all third-party apps that sync with iCloud (like BusyCal) to use app-specific passwords. An app-specific password is essentially a custom password that is different than your standard iCloud password. Only Apple's apps (Mail, Calendar and Contacts) can use your standard iCloud password. All other apps must use an app-specific password to connect with your iCloud account. Please read these instructions for setting up an iCloud App-Specific password for BusyCal. iCloud enables you to share calendars with other iCloud users. Once each user has configured BusyCal to sync with their personal iCloud account, you can share calendars with each other through iCloud. When a calendar is shared through iCloud, events can be edited by any user and changes sync between them. However, you cannot set up a shared calendar within BusyCal for iOS; you must do this in BusyCal for Mac, on the iCloud website, or in the Calendar app on iOS or OS X. For details, see Sharing Calendars with Others through iCloud in the BusyCal for Mac help. When sharing calendars with others, you can choose whether changes to that calendar made by other people appear in your Inbox. To do so, go to Settings > Calendars and tap the “i” icon next to the calendar name. Then turn Notify Of Changes on or off. Tap the Inbox (next to the gear icon) to display your notifications. Tap OK to dismiss each message in the Inbox. Or, tap Clear All to dismiss all messages with a single tap. iCloud places certain limits on calendar data. For more information, see iCloud: Limits for Contacts, Calendars and Reminders. BusyCal syncs all its data types (events, to dos, tags, etc.) with iCloud. Tags applied to events in BusyCal sync with other copies of BusyCal through iCloud, but do not appear in Calendar or other clients. To dos in BusyCal sync with the Reminders app on iOS and OS X through iCloud. They do not appear in Calendar for iOS or OS X.